This blog post is about healthy child development and some of the learning disabilities children can have from an underdeveloped eye movement system. Fixation, Tracking, and Saccades: visual efficiency skills that are the core of our visual system. Believe it or not, we are not born with the ability to maintain fixation on an object of interest, track moving objects, or quickly and accurately look between objects of interest. These skills are learned in the first few years of our lives, and refined during the first 10 years of our lives. When you fixate on a single small target you may take for granted that your eyes are able to maintain that fixation without �wandering� away from it. Every second or so your eyes are making tiny movements, refining their position to correct for drift. If your eye-brain connection is not fully developed, even this simple task can be very tiring. 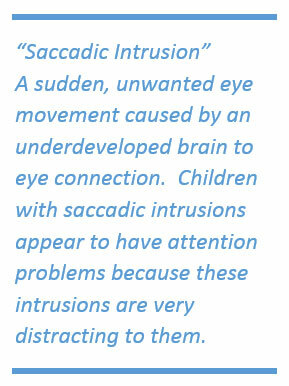 Even worse, saccadic intrusions may occur- unwanted dramatic eye movements that break fixation and distract the child. Vision Therapy can correct these issues. Eye tracking occurs when you are following a moving object. This skill is usually learned at about 6 months of age and refined over the first 5 years of a child�s life as they are exposed to games and play where tracking is necessary. Tracking an object that moves up and down at varying speeds as well as left and right is especially difficult. Vision Therapy can improve tracking. Saccades are dramatic shifts in gaze. 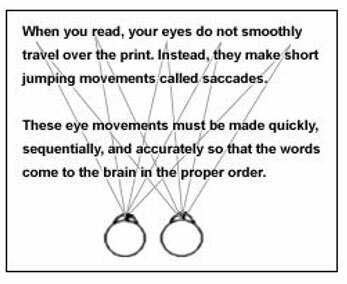 Saccades are more difficult than simple fixation or tracking eye movements. Most children will not be able to make accurate and quick saccade movements without tiring until age 5. Most people take for granted that when they want to look at something in their peripheral vision they can move their eyes appropriately to examine the target. Children with saccadic dysfunction are not so lucky- when they attempt to shift their gaze to a target they may undershoot or overshoot the target. At that time, they must pause and retry. As this happens hundreds of times throughout the day it becomes distracting, time consuming, and extremely tiring. Most importantly, saccades are used to read text. When you read, you make about 1 saccade for every 2-3 words. When a child with saccadic dysfunction reads, they may take 3-4x as many saccades to read the same text. Children with saccadic dysfunction will often do poorly in school activities that require a lot of reading. Vision Therapy has been proven to improve saccadic function and help children struggling in school.